The outstanding characteristic of a market economy is that production does not occur as a result of some grand, master plan; rather, it is the result of the pulls and pushes of supply and demand, of the numerous uncoordinated decisions of individuals and firms. As individuals are assumed to seek to maximise their own satisfaction, and firms maximise their own profits, decisions made are likely to be strictly on the basis of private costs and benefits only. Herein lies the problem: unless the full social costs and benefits of production and consumption decisions are taken into account, so that MSC is equated to MSB, social inefficiency and a misallocation of society's scarce resources will result. So, what measures can a government take to rectify such inefficiency, and how successful is it likely to be? As is the case with most important questions in economics, a range of answers is possible, depending largely on the political perspective of the respondent. At one end of the spectrum, governments could 'leave well alone', essentially not interfering with markets but trying to gently persuade firms and individuals to modify their behaviour. At the other extreme, the market could be completely replaced by direct government provision, and in between various policy options are possible. We now turn to an examination of some of these options. Direct provision of goods and services - this means the government providing the good or service themselves, perhaps through state-owned or nationalised industries. The extension of property rights - this means giving people more right of ownership over their immediate environment, so that they can enforce environmental and other standards. Taxes and subsidies - where an activity causes negative externalities it could be taxed and where there are positive externalities, it could be subsidised. Tradeable pollution rights - this involves allowing companies to pollute a certain amount (a 'permit to pollute') but then creating a market for the permits, so that if they pollute more than the allowance they have to buy extra permits. However, if they pollute less, then they can sell their surplus permits. Regulation, legislation and direct controls - this involves setting legal limits or regulations to prevent negative externalities or perhaps to reduce their impact. Perhaps there is one more alternative - the use of 'nudge theory', rather than coercion, to persuade people to change their behaviour. 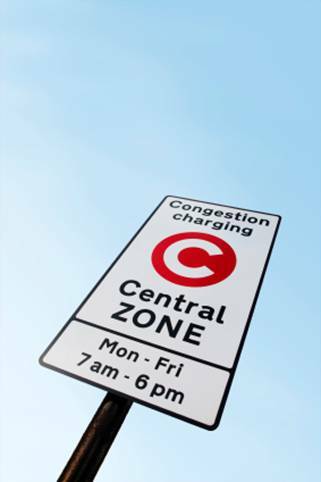 Can a nudge replace a congestion tax?